Colorado Death Ride Charity for ALS — $50 discount for DWC Members! DWC Members get $50 off registration through March 1, 2018! Contact Spencer for the code! 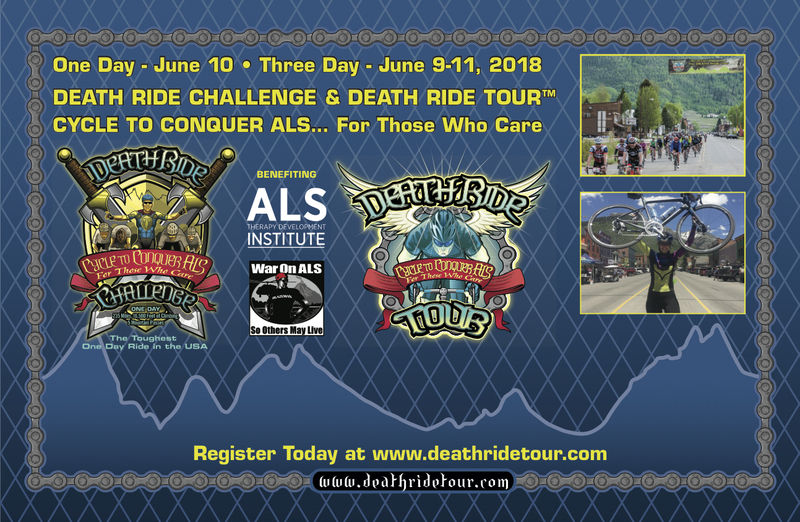 The DEATH RIDE Tour Inc. was formed because of a love and passion for cycling and a dedication to support research for the devastating, always deadly disease ALS (Amyotrophic Lateral Sclerosis) the Lou Gehrig Disease. The idea to put on challenging cycle events that would push the ability of the participant and at the same time bring a strong sense of accomplishment for a task well done. As said by “Bicycle” Bob Gregorio, the original 17-time DEATH RIDER, the DEATH RIDE and all the other events put on by DRT Inc are more than cycling challenges; they are a test of will. A conversation with one’s own faith of spirit to endure. The confidence gained by preserving in the face of hardship and exhaustion in these events serves one in all facets of life”. The DEATH RIDE Tour Inc. is a registered 501c3 Non-Profit, Tax ID 27-1823372.